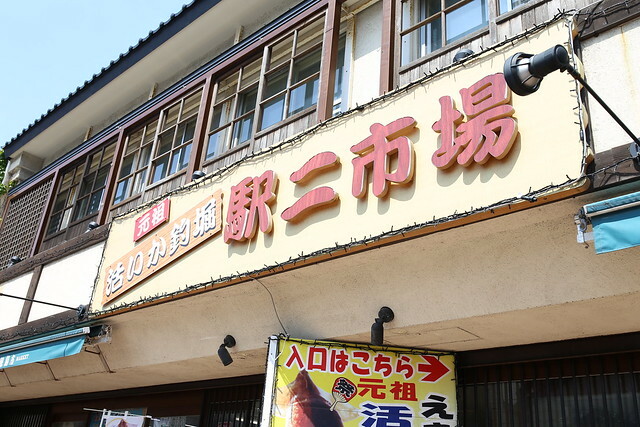 This is the first time to visit Hakodate Morning Market ( 函館朝市, Hakodate Asaichi) in Hakodate city, Hokkaido Prefecture. This is the spot for both locals and tourist to get their fresh seafood. 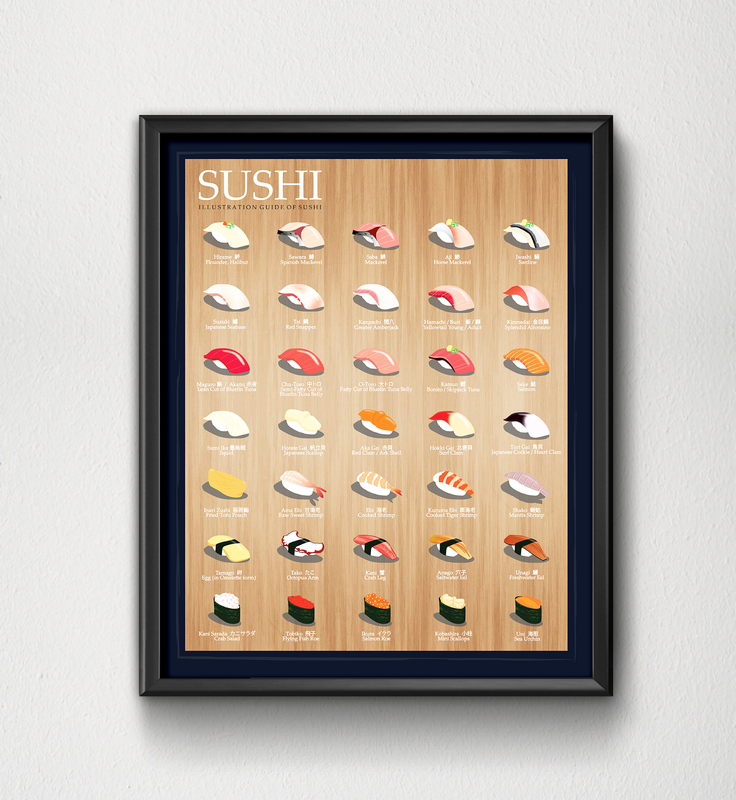 The market is full of fresh seafood that you can buy them alive, or sometimes they can cook it for you. 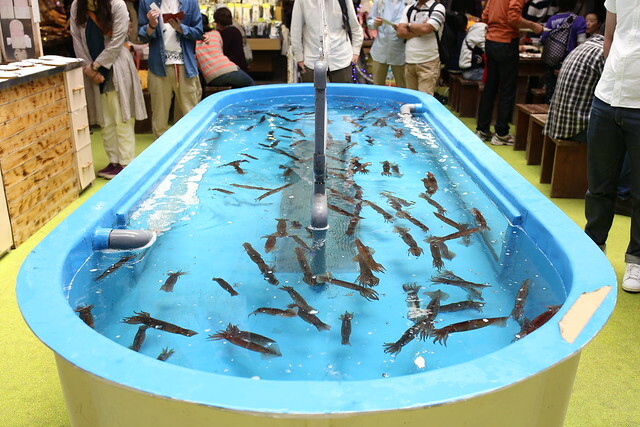 You can also fish your own squid and they will prepare and cut it for you so you can enjoy fresh raw squid! 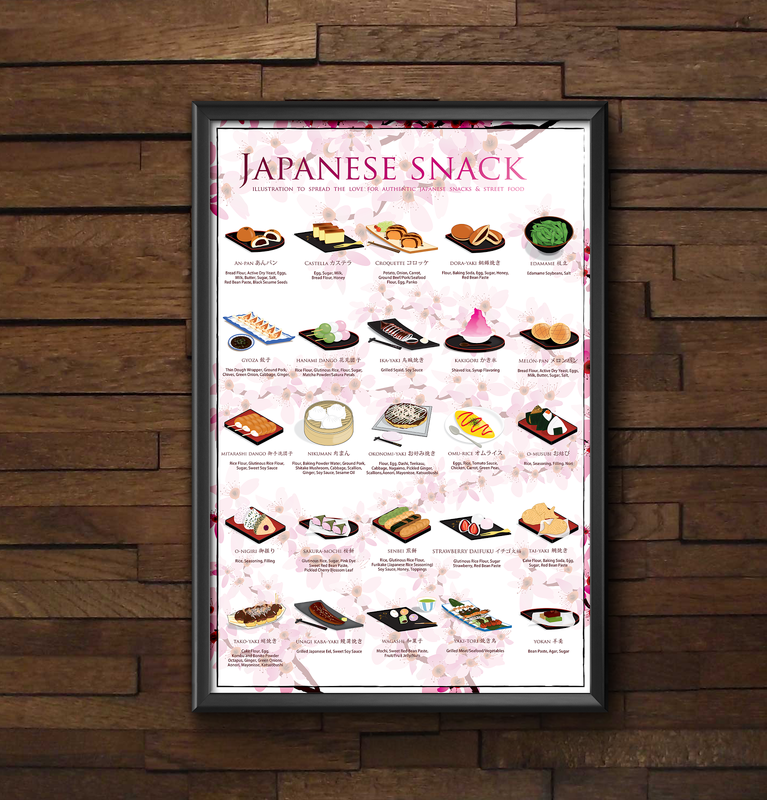 For souvenirs, dried seafood like dried squid or shrimp chips are very common and easy and light to carry around. 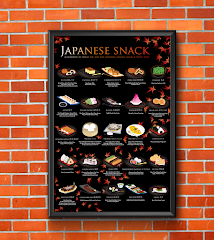 NOW, let's go discover what I found at the morning market of Hakodate! 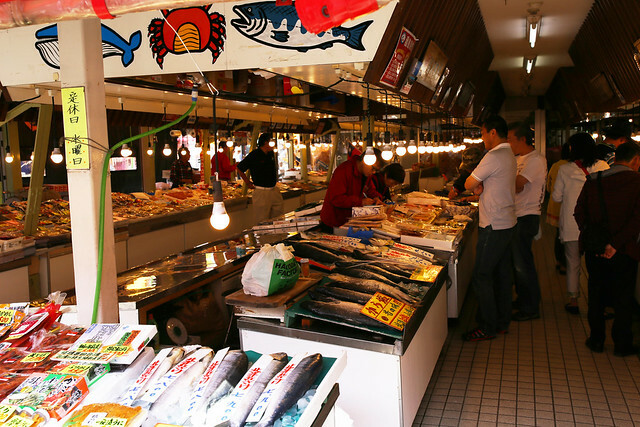 Hakodate Morning Market is basically a neighborhood for selling seafood and local specialty. There are both outdoor and indoor shops. One of the most interesting thing to do is to fish your own squid which is only around 500 yen. 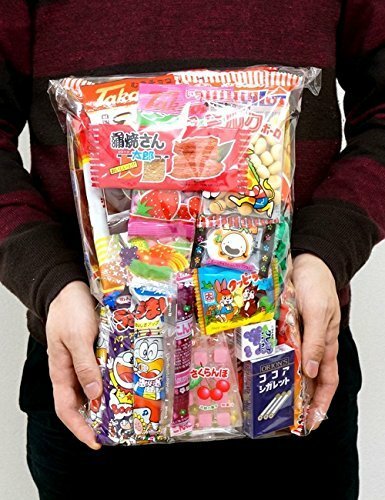 (They give you a 200 yen discount coupon for buying anything from the indoor shops too.) 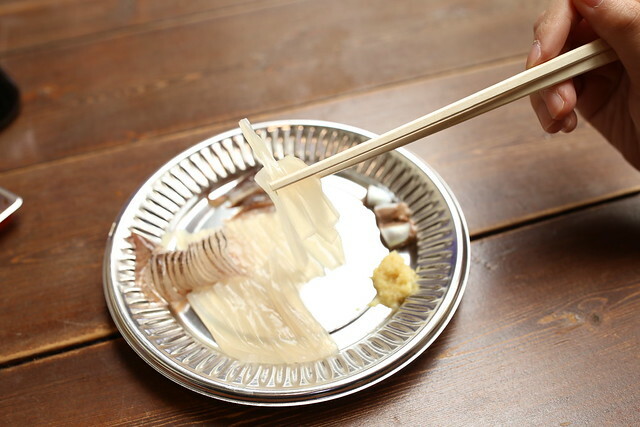 After fishing your squid, staffs will clean and prepare the squid for you right away. Serving with soy sauce and grated ginger, you can now enjoy fresh squid that you just caught! Next, we stepped out to the exciting outdoor shops. There are lots of seafood to choose from, but I actually stopped by an ice cream shop because I can't wait to try my first Hokkaido ice cream! 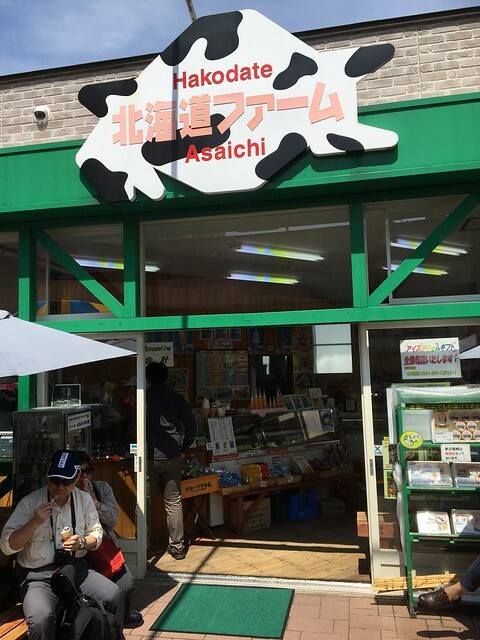 The prefecture is famous for their dairy such as milk, cheese, ice cream, etc. 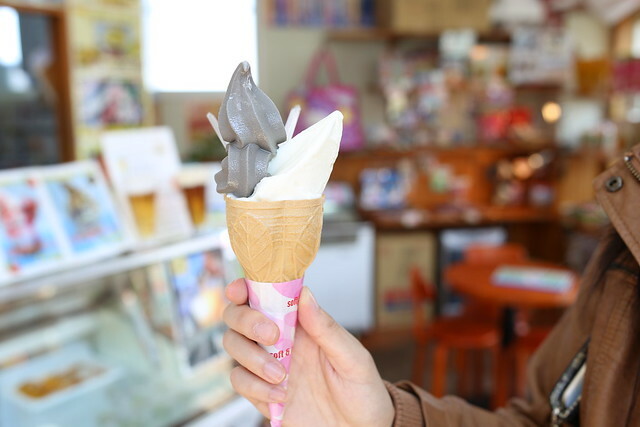 This shop has their specialty ice cream flavor: squid ink! 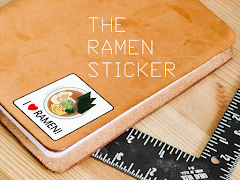 It might sound very exciting, but the flavor is actually very subtle, no fishy or seafood taste. What I am surprised about is the condensed flavor of milk in this ice cream. 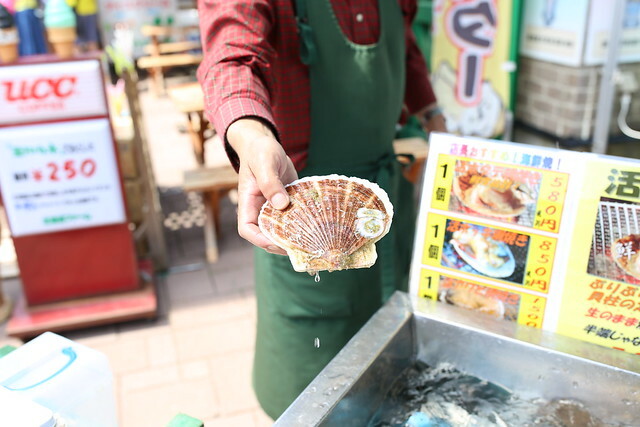 Next to the ice cream shop, there is a small outdoor grilling vendor with fresh clams. 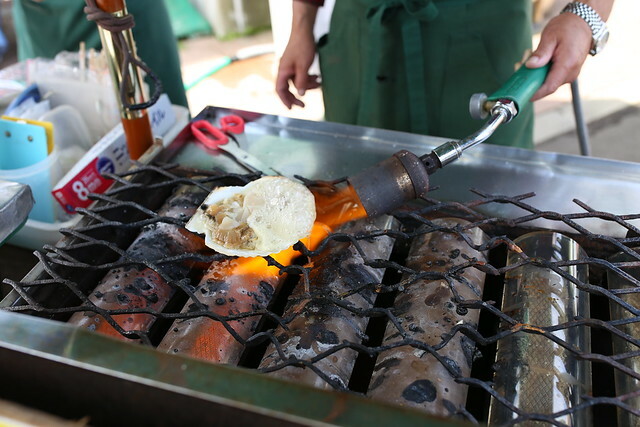 cooking scallop with grill + torch fire! 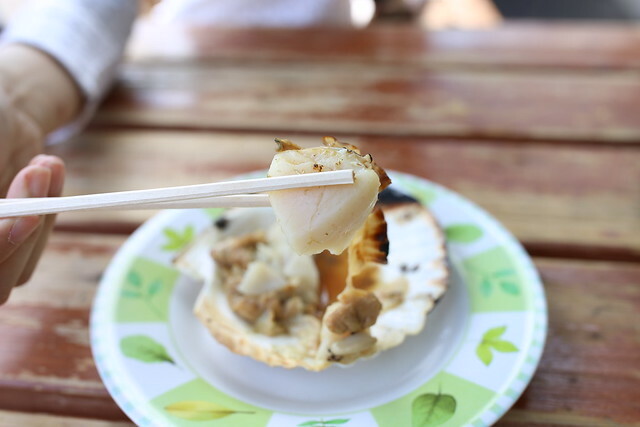 The fresh clam was cleaned and cooked on grill for about 5-8 minutes. It was seasoned with soy sauce in mid-way of cooking and a torch was used to boil the sauce and clam's broth exponentially. 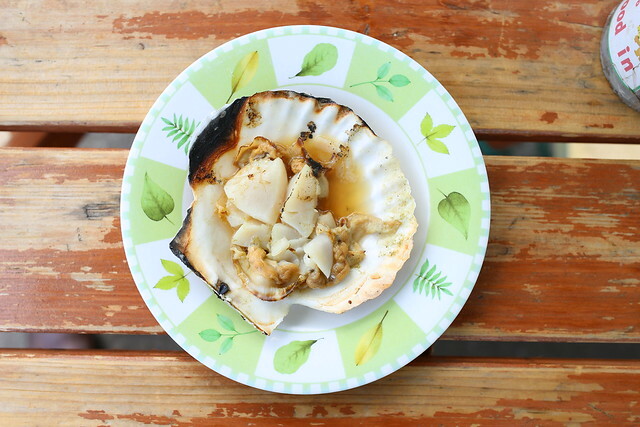 The result is an "almost cooked" scallop, which remain the freshness of the scallop! 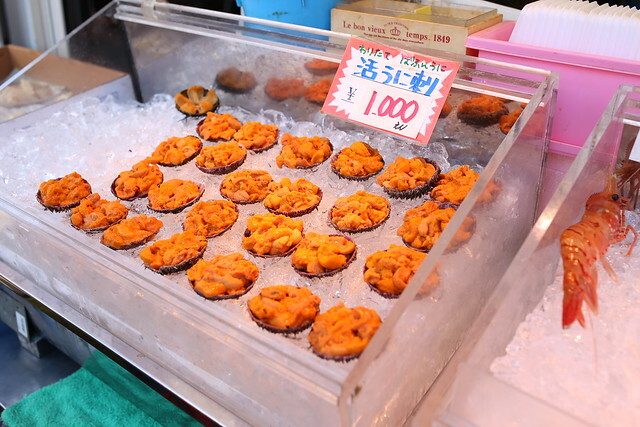 Sea urchin from Hokkaido is definitely another seafood to recommend. To tell you the truth, sea urchin is not my favorite seafood. 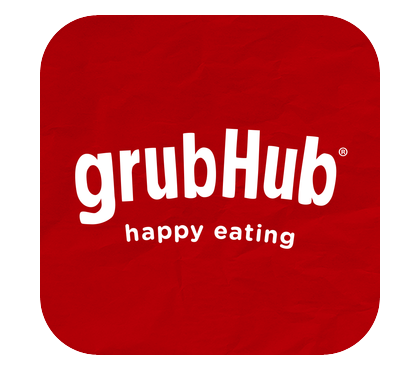 It is usually too creamy and filling. 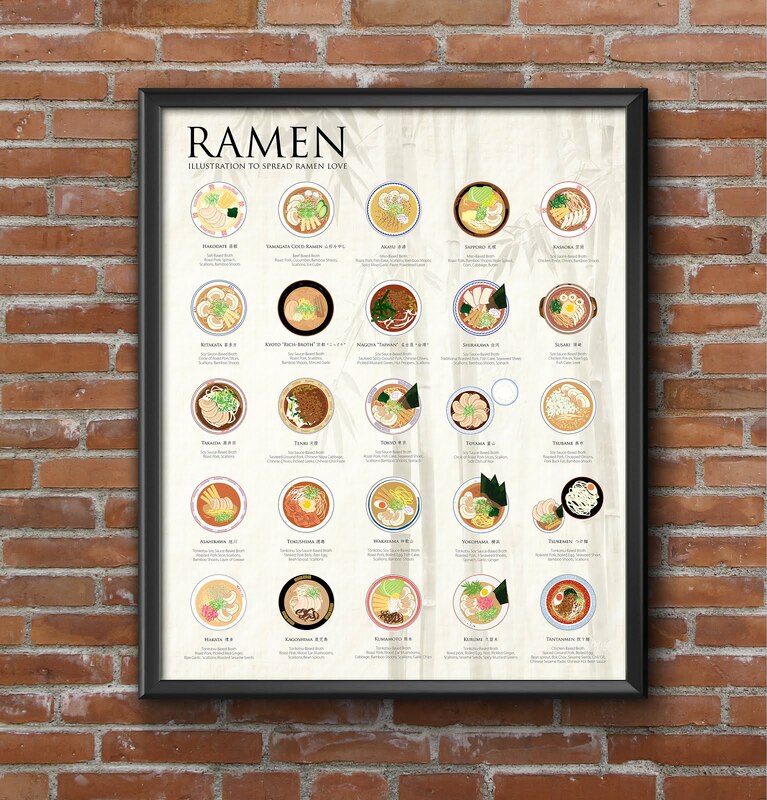 The flavors are too dense and overwhelming to me. HOWEVER, the sea urchin here is completely the opposite. it is a lot lighter, the flavor is a bit sweet. The taste of briny ocean feels natural and subtle. It is still creamy, but a lot easier to go down. 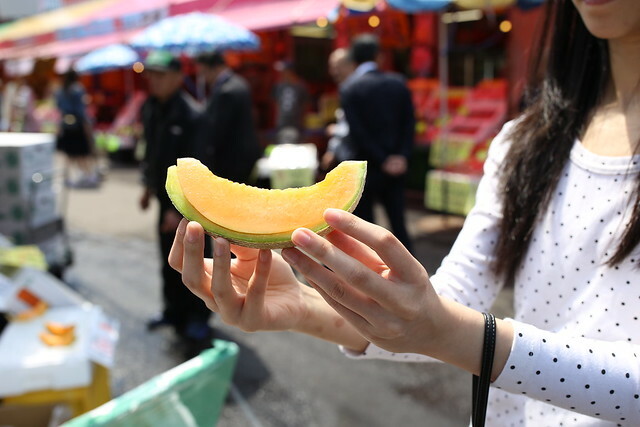 one slice of sweet & juicy "Yubari King" melon! 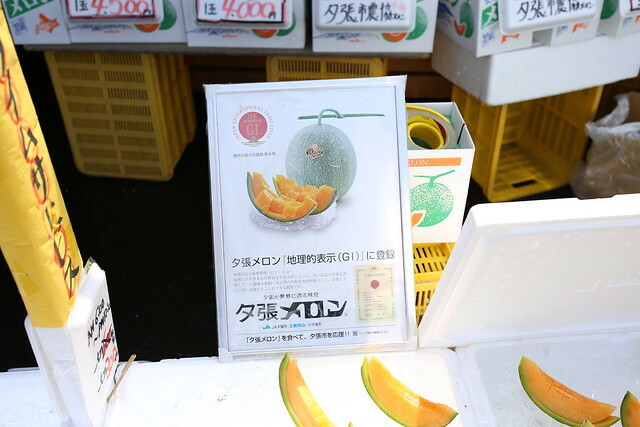 *Fun fact: The year in May, a new highest bidding price was recorded 3 million yen (27,295 USD) for a pair of Yubari melons, beating the 2.5 million bidding price in 2008. Check out related article HERE! 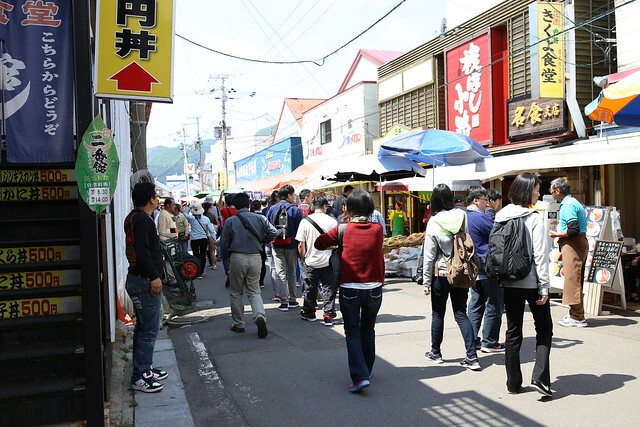 From this trip to Hakodate Morning Market, I agree with a lot of people that seafood in Hakodate is really something. 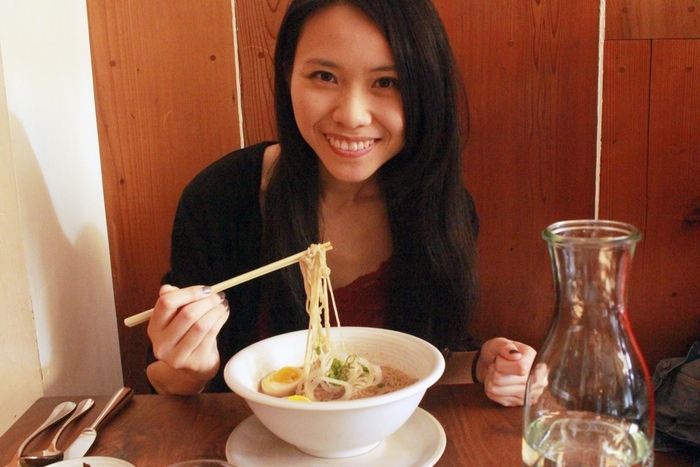 I would definitely visit this small town again for more seafood hunt and Hakodate ramen next time! i love the fresh melons, and some of the food, not raw though. Yes!! Fresh melons are the best! :)) I wish I can have some again soon! I feel some jealous of you! what a trip! 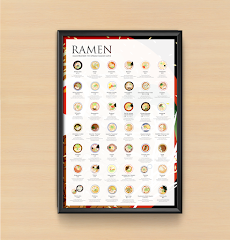 I never been in a place like that, looks very interesting to try all of that, good meals and also a great experience! I love squid. I've even tried the squid chips but squid-ink ice cream? That's a must. I have to try it. 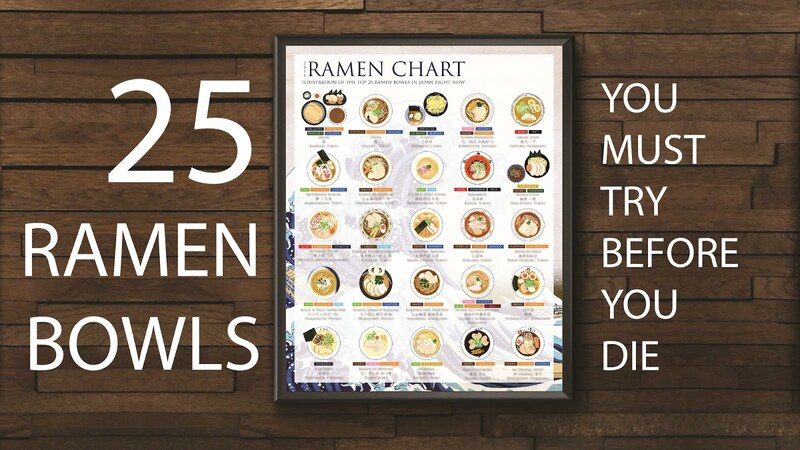 Thanks for your fun foodie details. Next time I'm in Japan, I may stop by just for the clams. It sounds wonderful to have a clam right off the grill. OMG The Hakodate Morning Market is soo cool ! Seafood in Japan is always something special! Want to visit Hokkaido. But not sure if summer or winter is better time. I'm trying so hard to imagine the squid ink ice cream and I just can't... actually, maybe I'm trying not to, lol. I know you said it doesn't taste like fish but I just can't fathom it. I would love to get my daughter to try it though she loves ice cream. I wonder how squid ink ice cream tastes.